Knitty! Alternate Colors for the Sophia Loren Pullover | Knit Like You Mean It. Something rather incredible happened to me: I submitted a pattern to venerable knitting website Knitty, and they accepted it. 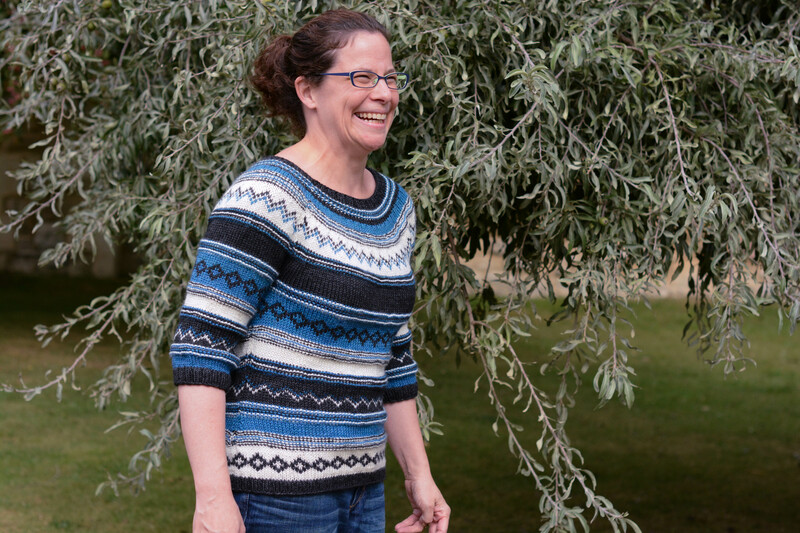 The Sophia Loren pullover is inspired by a photo of Loren from the movie Woman of the River, and is knit in The Fibre Company‘s beautiful yarn Canopy Worsted. 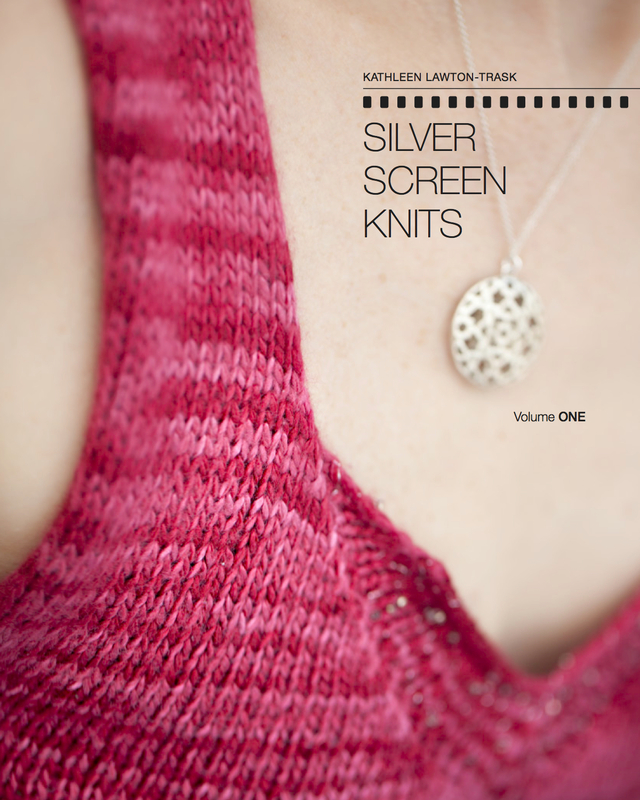 This pattern will appear in Silver Screen Knits: Volume II, which is coming out next spring (Volume I this fall!). But I digress. 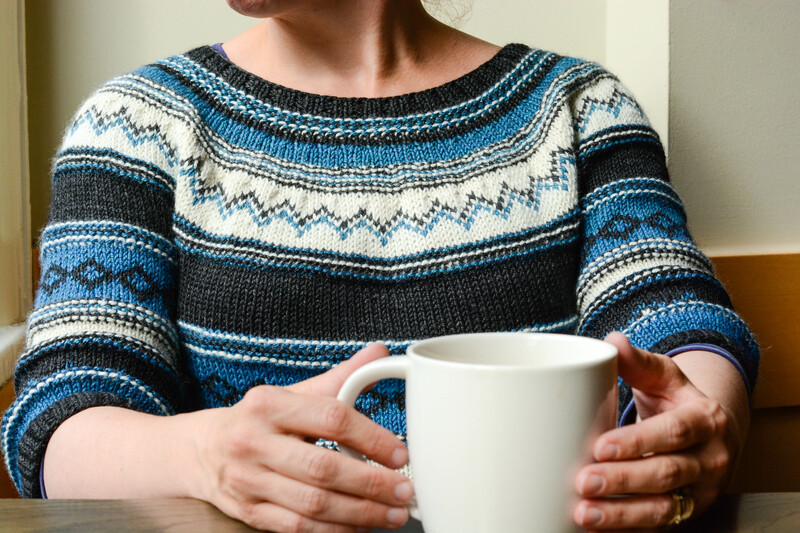 As sometimes happens (sadly…sadly) two of the colors used to knit this sample of the sweater have been discontinued. Chicklet Tree and Cat’s Paw are no more, but that doesn’t mean you can’t knit the sweater. Here’s one combination, which I’m modeling in the D size (37.25″ bust). I am not a model. But, hey, here’s the sweater! Photo by the divine Lynn Ainsworth. This also gives me the opportunity to talk about ease in the sweater. The models who are wearing the green and yellow version are wearing it with very little ease. In the photos here, I’m wearing the blue and black sample with 1.25″ of ease. You can see that more ease gives you a slightly different look. Cozy Sweater, Cozy Cup of Tea. Photo by Lynn Ainsworth (still divine). The silver lining, as it were, to these colors being discontinued is that you have lots of room to imagine other color combinations for yourself. [Did you know that more than half the people who knit a pattern do it in the color in which it’s pictured?] So now is a time to play with the beautiful colors in which Canopy is available and see what’s right for you. What color combination might you use? Three contrasting colors, as in the black and blue version, or three that slip into each other, as in the green and yellow? Hop on into the comments and make suggestions! Wow! Congratulations Kathleen! And that’s a lot of pressure to model a sweater named Sophia Loren, but you look wonderful and it’s a beautiful sweater. I look forward to getting your book and ever having the time to knit such a sweater! Gorgeous sweater, it was the first to jump to my eyes from the new edition of Knitty. I would knit it in pastel not contrasting colors, probably in the yellow-orange range. Congratulations! This is a beautiful sweater, I hope Sophia sees it and is pleased with the tribute. I think Acai, Obsidian and River Dolphin would be a nice combination. The River Dolphin / Purple Passion / Crocus combination looks like it would be gorgeous… though actually if I could knit I’d probably try Purple Passion / Laguna / Crocus. Thanks for appreciating it! There will be more to come – I very much want to show real people wearing the garments I’ve designed.